Friendship bracelets are a nostalgic craft that never go out of style. Formed by a series of knots that create a woven pattern, friendship bracelets are actually a type of macrame. 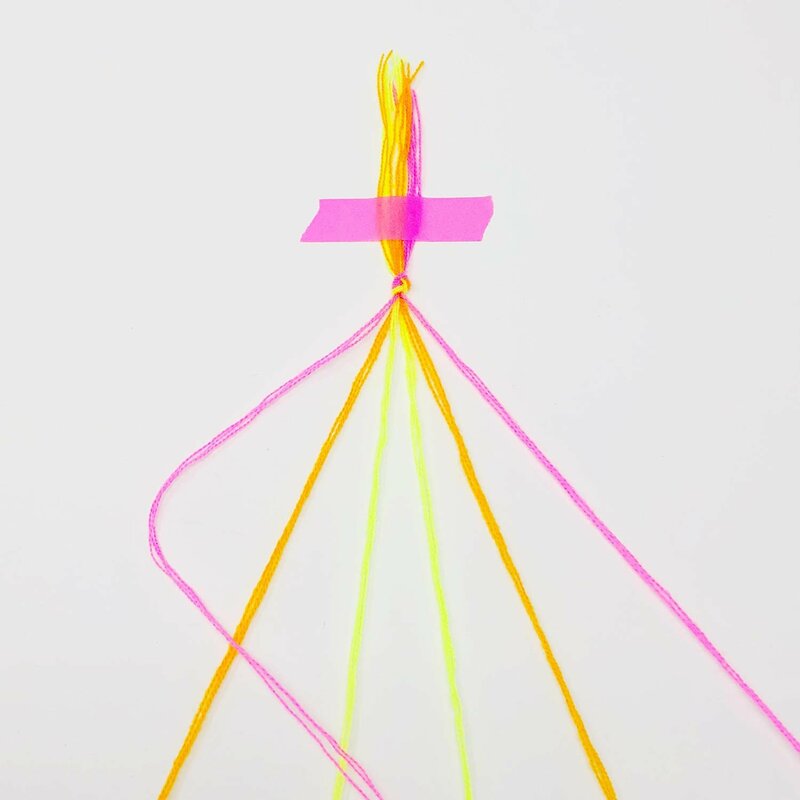 Use Omegacryl yarn or embroidery floss and follow the instructions below to master the four basic knots and learn two beginner patterns, Candy Stripe and Chevron. 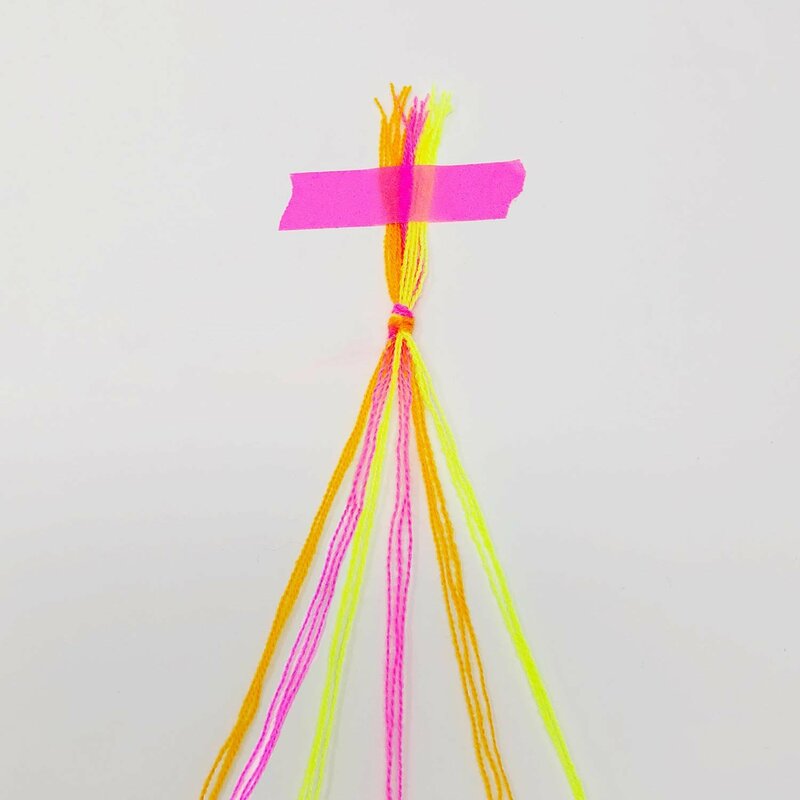 Then have fun playing with patterns and adding embellishments to create friendship bracelets that are all your own! 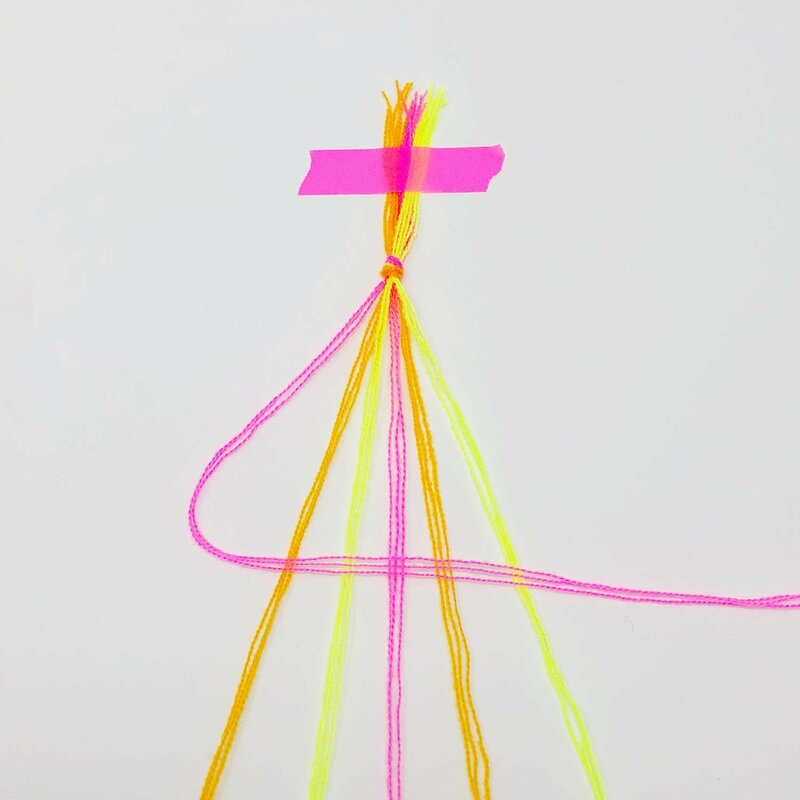 You can find our Friendship Bracelet DIY Kit plus additional yarn and supplies in our shop. Forwards knots allow your knots to travel from left to right in a forwards direction. You can remember forwards as the same direction we read in English. 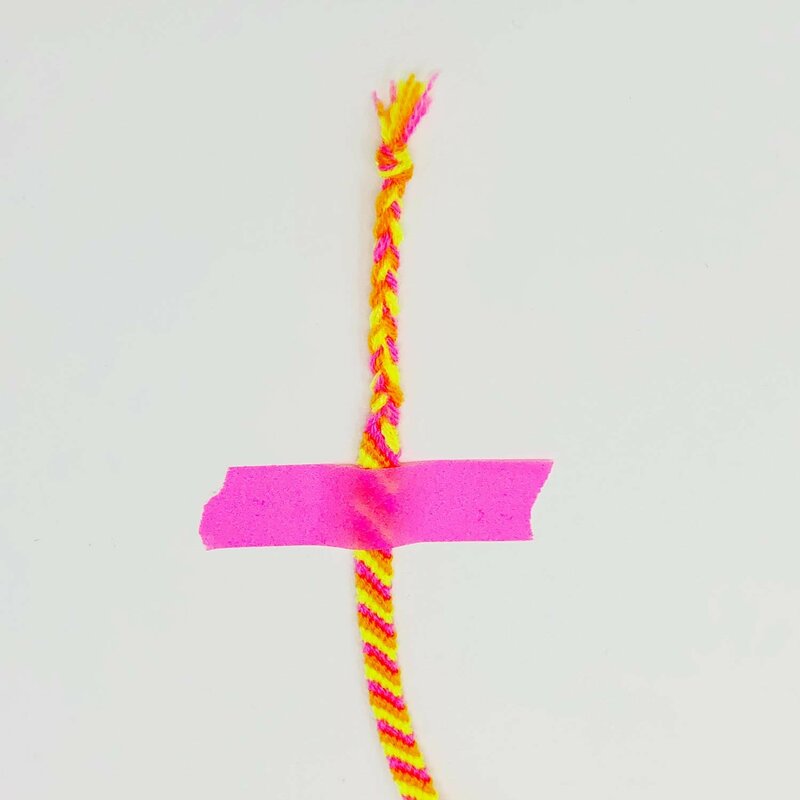 To make a forwards knot, take the strand on the left and bend it on top of its neighbor to the right, creating a “4” shape. 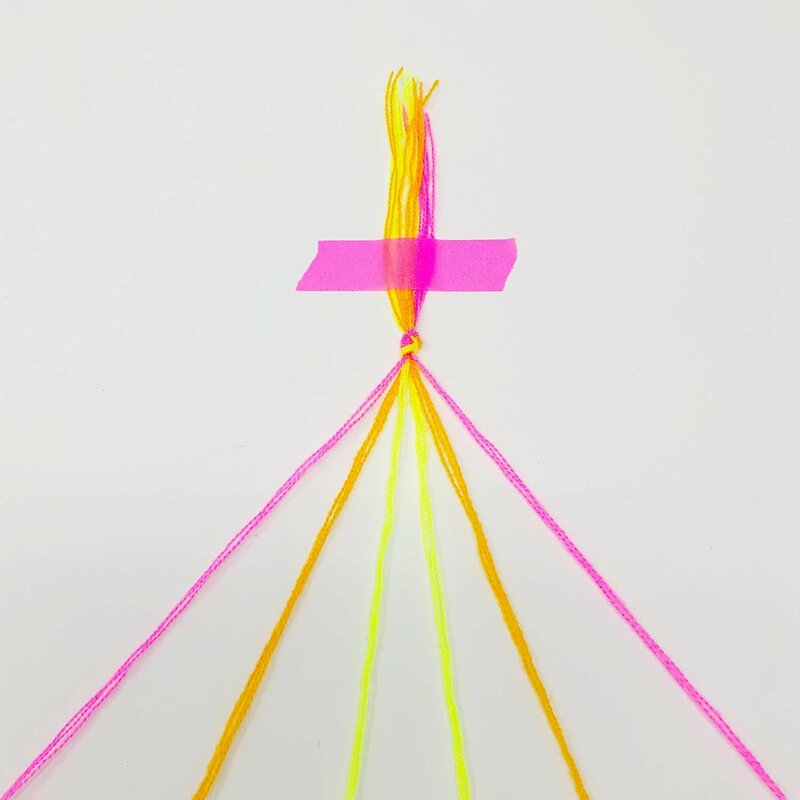 Wrap the tail of the left strand (pink) around its neighbor (orange) by going under it and pulling the pink tail out through the space between the pink and orange strands. 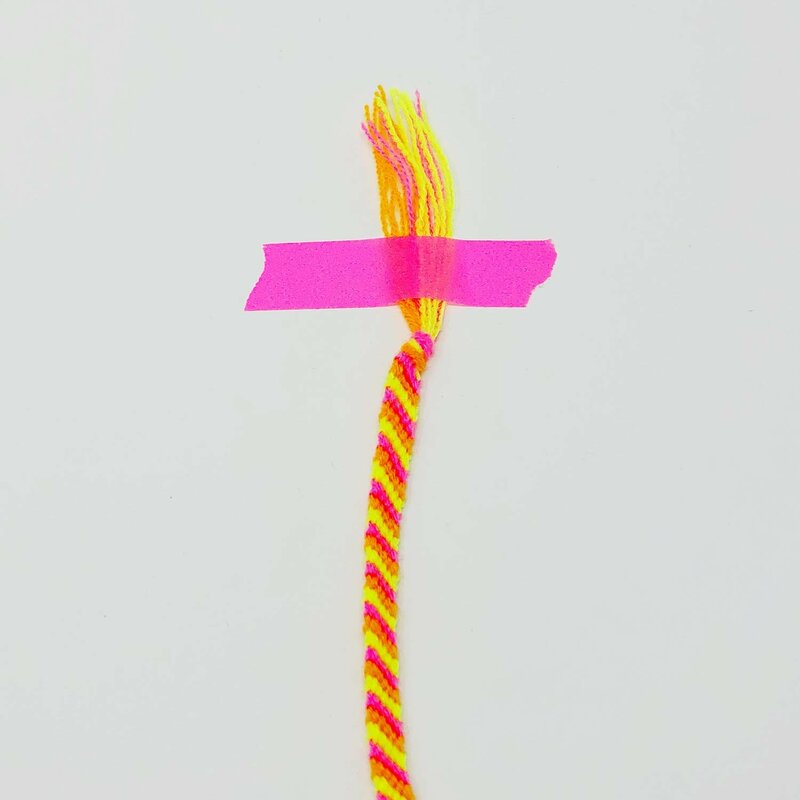 Hold the interior strand (orange) straight and pull knot up towards the top knot, tightening to secure. The pink strand will now fall to the right of the orange strand. Tie a forwards knot once more using the same two strands to complete your forwards knot. Backwards knots allow your knots to travel from right to left in a backwards direction. You can remember backwards as the opposite direction from which we read in English. To make a backwards knot, take the strand on the right and bend it on top of its neighbor to the left, creating a backwards “4” shape. 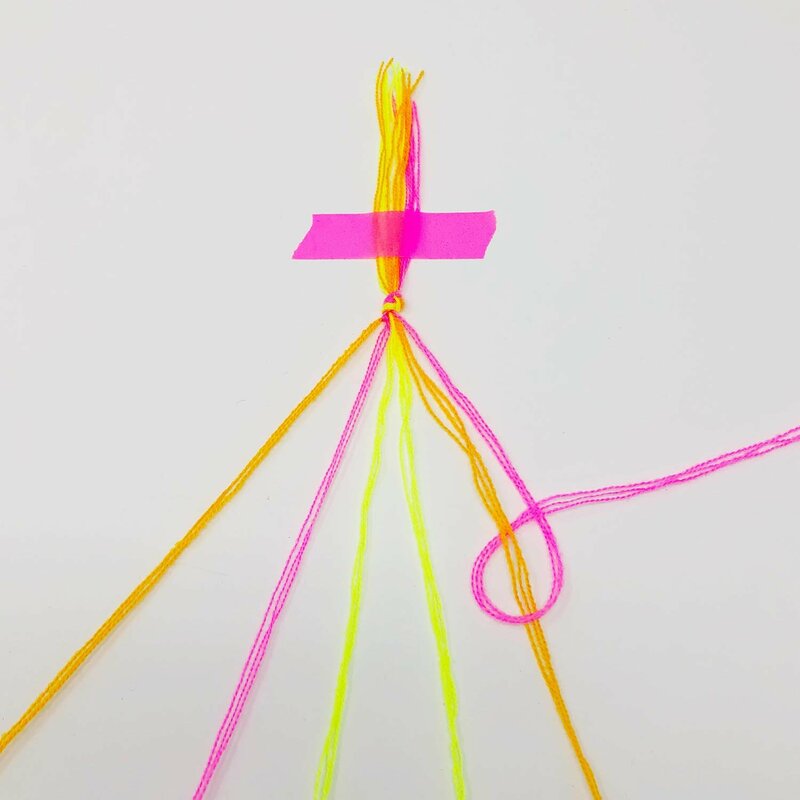 Wrap the tail of the right strand (pink) around its neighbor (orange) by going under it and pulling the pink tail through the space between the strands. 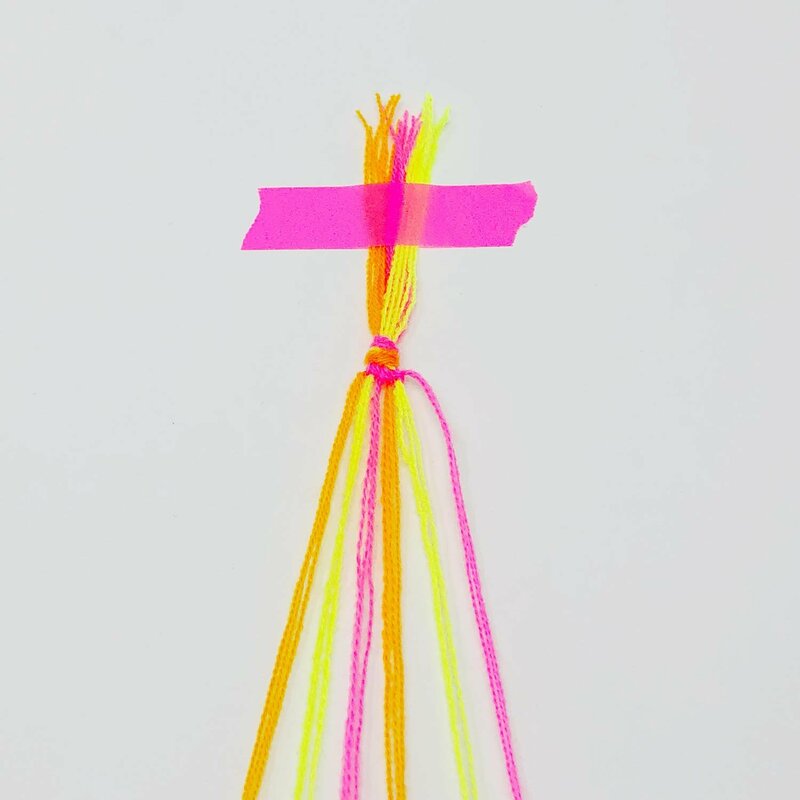 Hold the interior strand (orange) straight and pull knot up towards the top knot, tightening to secure. The pink strand will now fall to the left of the orange strand. Tie a backwards knot once more using the same two strands to complete your backwards knot. Forwards-backwards knots and backwards-forwards knots are used to change directions in a pattern, so if your knots had previously been traveling in one direction, a f-b or b-f knot will turn the knot to travel in the opposite direction. 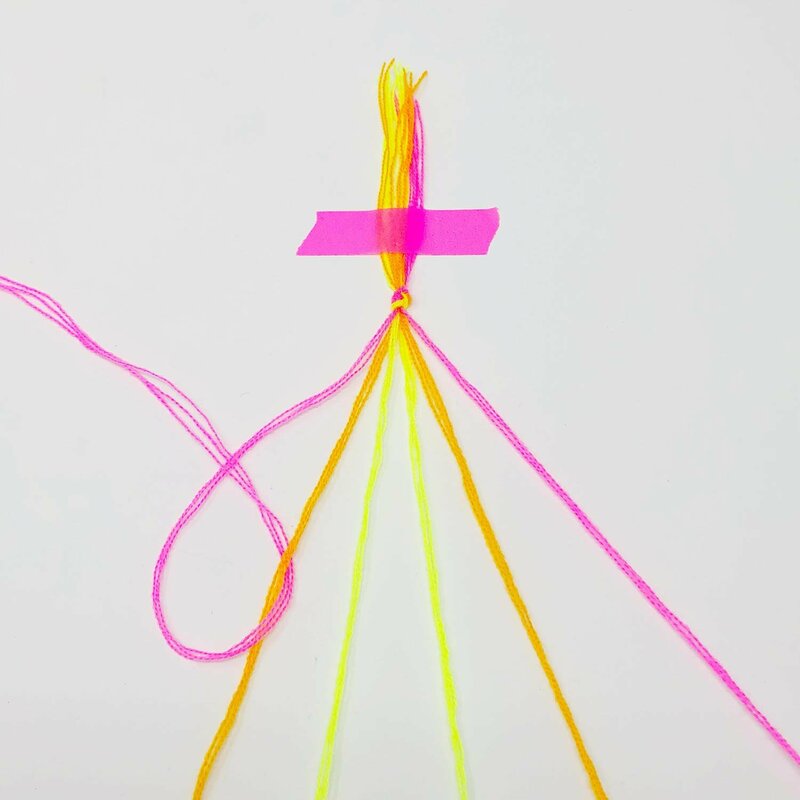 Much like other fiber crafts such as cross-stitch and knitting, friendship bracelets have diagrammed patterns you can follow to create infinite beautiful designs. With just a little know-how, you can quickly learn how to interpret patterns and create intricate designs within your friendship bracelets! Cut as many strands of yarn as you'd like to 32” and tie them together 3” down. Separate strands in the order of the pattern you want to create. The more strands you incorporate, the wider your bracelet will be. Working from the left to the right, tie a forwards knot by taking the left-most strand and bend it on top of its neighbor to the right, creating a “4” shape. 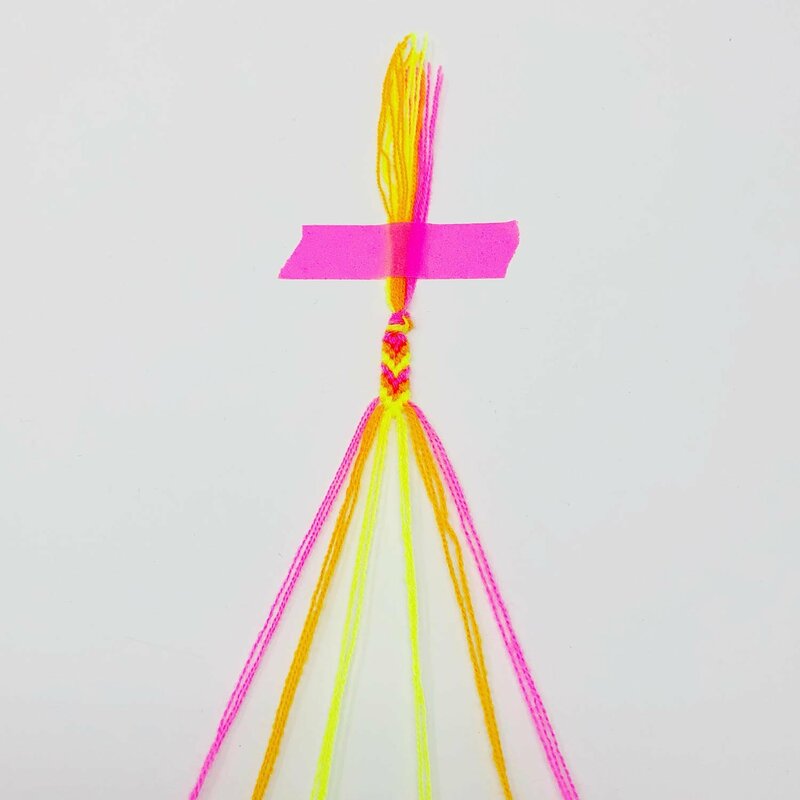 Wrap the tail of the left-most strand (pink) around its neighbor (orange) by going under it and pulling the pink tail out through the space between the strands. The pink strand will move to the right. 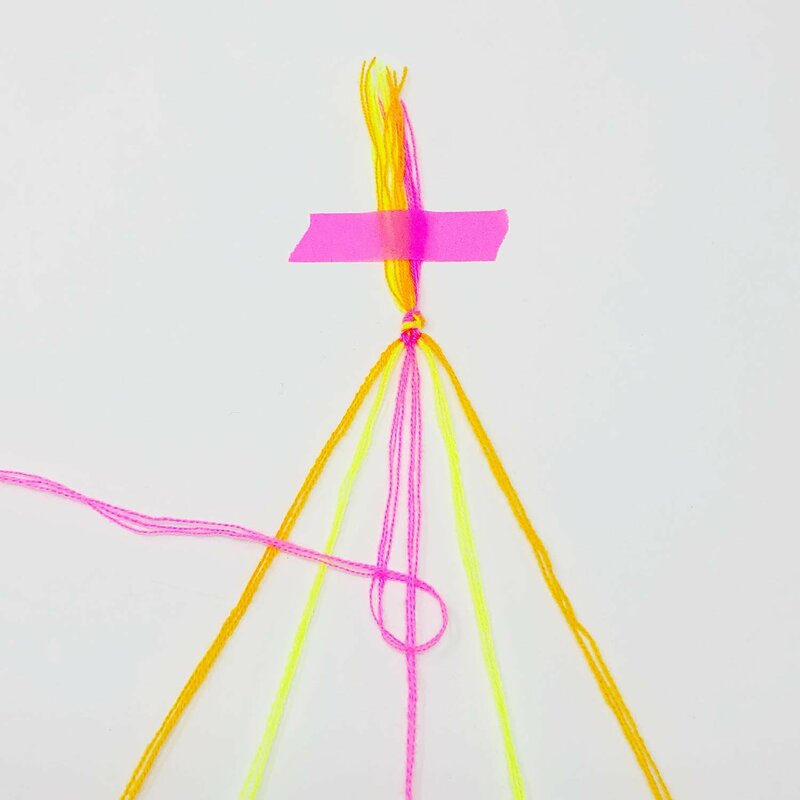 Repeat the same process of tying two forwards knots around the next string (yellow). Continue forwards knotting each strand with the pink yarn until the pink ends up all the way to the right. 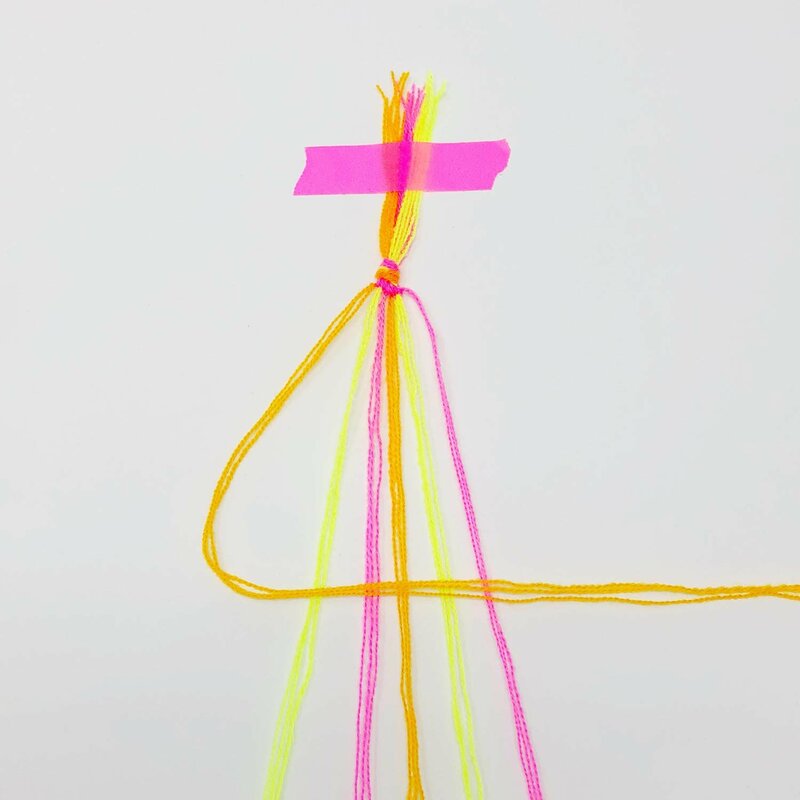 Repeat the process with the new left-most strand (orange), working your way across each strand of the bracelet. Stripes will form down the length of your bracelet. Continue until you’ve reached your desired bracelet length! 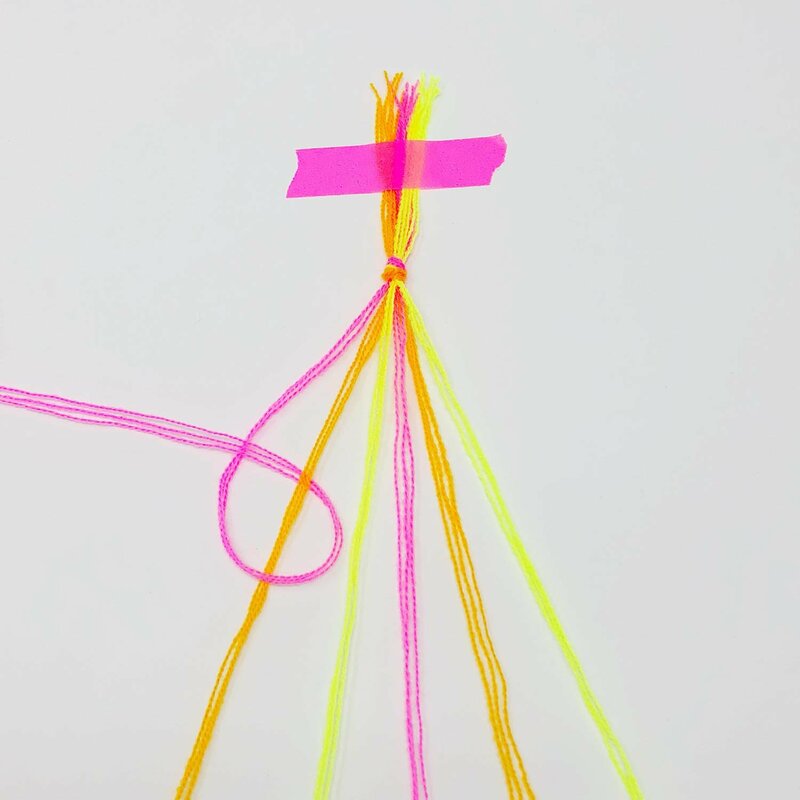 To finish your bracelet, braid a 2.5” braid and tie a knot to secure. Undo the starting knot and braid that end as well. Friendship bracelets originate from Central America, namely Guatemala, and made their way to the States only as recently as the 1970s. Friendship bracelets are a form of macrame since the woven patterns are created by knots. It is traditional to make and give a bracelet to a friend as a sign of long-lasting companionship. As the maker ties the bracelet onto the wrist of the recipient, the recipient can make a wish on the bracelet. When the bracelet falls off, it is said the recipient’s wish will come true! Choose as many colors of yarn as you'd like can cut two strands of each color to 32". 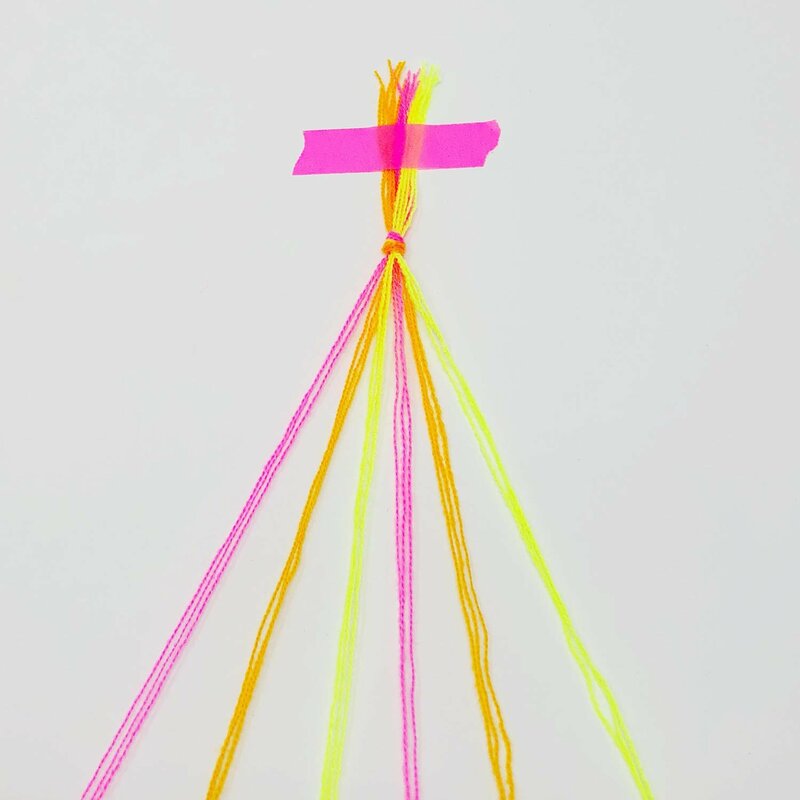 Tie all of your strands together 3” down. Separate strands so that the color order mirrors itself. Working from the left to the right, tie a forwards knot by taking the left-most strand and bending it on top of its neighbor to the right, creating a “4” shape. 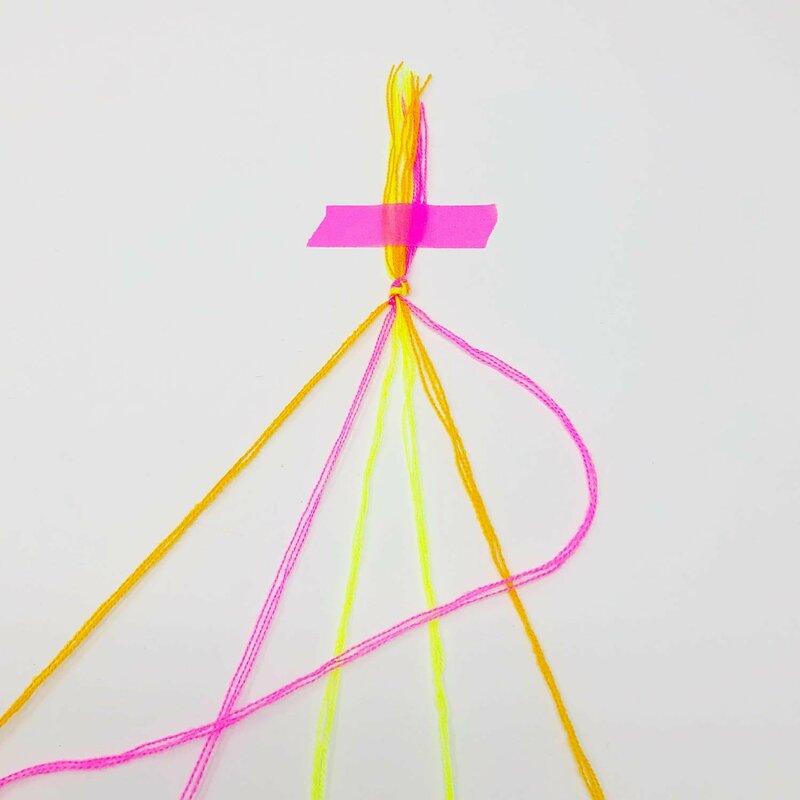 Follow the same steps using the right-most string but instead bend the string creating a backwards “4.” This is a backwards knot. 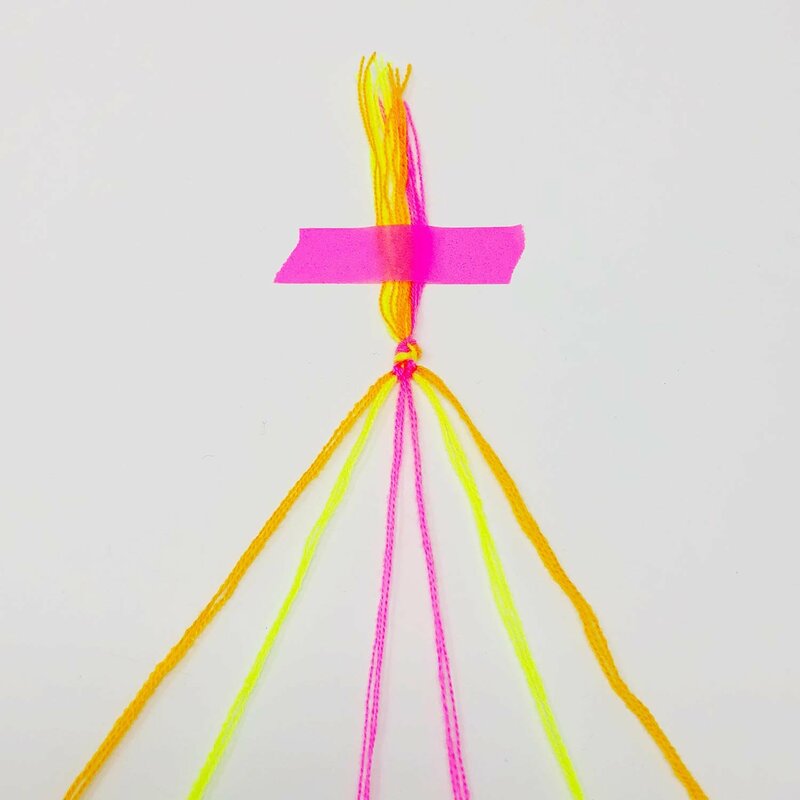 Wrap the tail of the right-most strand (pink) around its neighbor (orange) by going under it and pulling the pink tail through the space between the strands. Repeat to complete your backwards knot! Both outside strands should have moved one spot closer to the center. 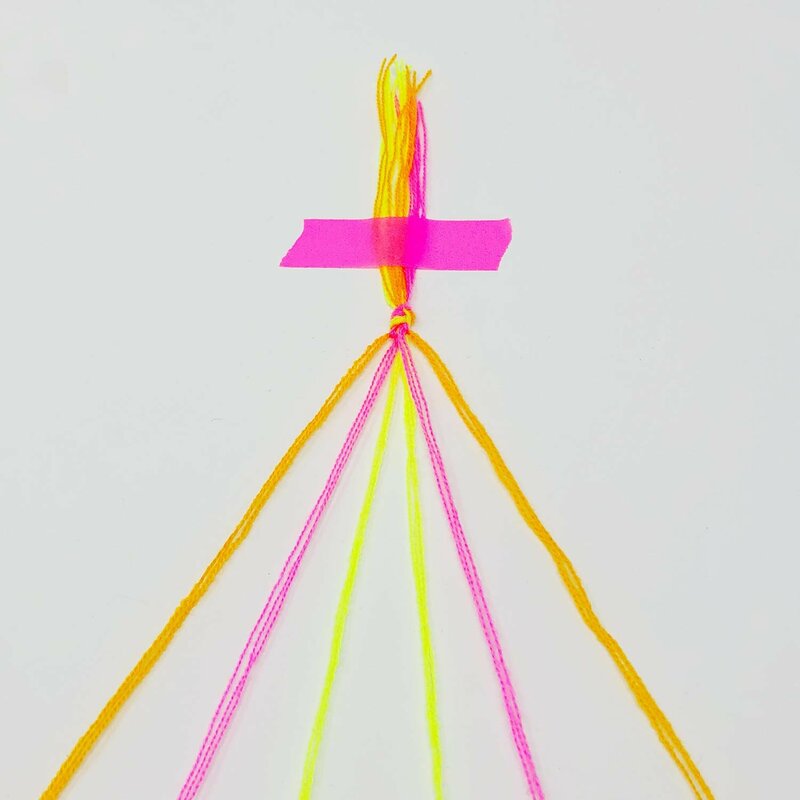 Repeat the process, knotting around the next neighboring strands (yellow) until the pink strands are both in the center. To comeplete the chevron, knot one pink strand around the other twice (it doesn’t matter which one!). Reapeat steps working the outside strands to the center until your bracelet is desired length. See last step of "Candy Stripe" pattern above to learn how to finish your bracelet. 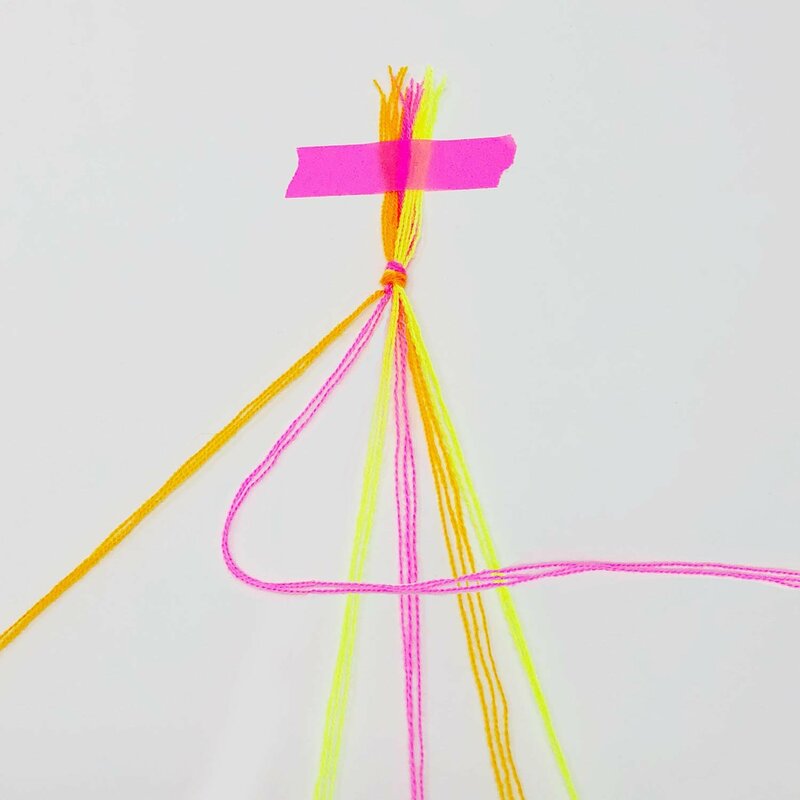 There's more to learn when it comes to making friendship bracelets! 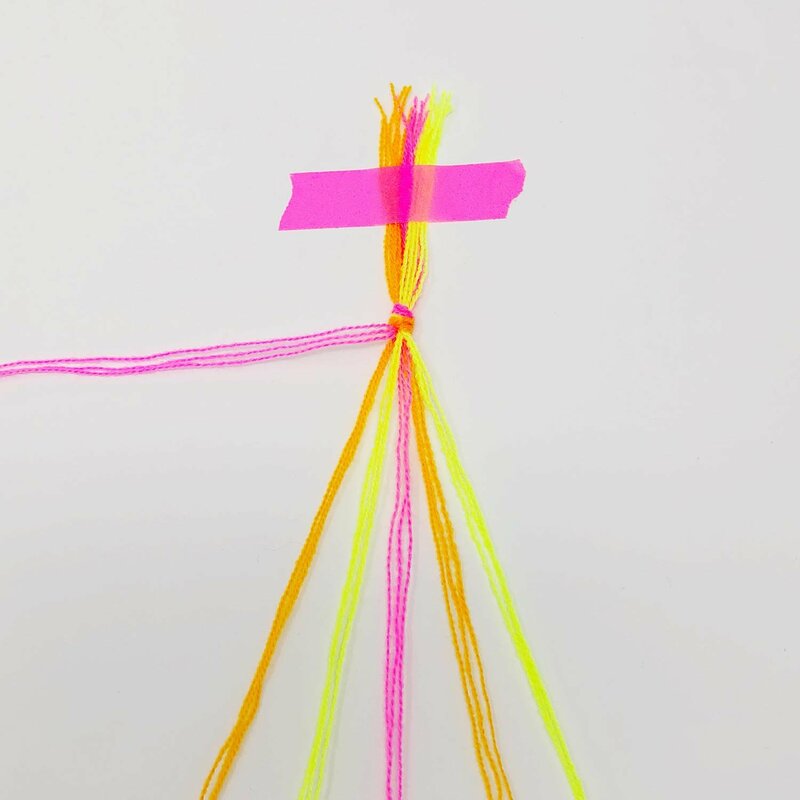 Discover the thoughtfully curated (and totally stylish) elements of our Friendship Bracelet DIY Kit on the TNTP blog. Stay tuned for more fun patterns and project ideas, also on our blog!